kandeej.com: BEST MAKE-UP LOOK... EVER. I thought it would be fun to do something a little "cray cray" (AKA crazy if you're not familiar with when I say that)! It not dumb. APRIL FOOLS! It's totally wearable. APRIL FOOLS! You should wear it today and no one will look at you weird! APRIL FOOLS! I stayed up way too late the other night trying to edit this video... not April fools. I am so excited Mindy Gledhill said I could use her song, Whole Wide World. Not April Fools. Yes, that means you will finally get to hear a new song beside all the music from imovie I normally use. Not April Fools. Have fun watching me turn into a rainbow. Not April Fools! CLICK ON THE YOUTUBE LOGO ON THE VIDEO (LOWER RIGHT HAND CORNER) TO WATCH IT BIGGER! Completely unrelated to your April fools joke but you are such a blessing. The best make up look I've ever seen! Thank you Kandee for this novelty. Sooooo FUNNY....HUHLARYUS!!!! 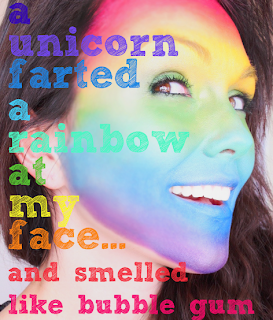 Girl I was cracking up, especially about the unicorn farting all over my face! 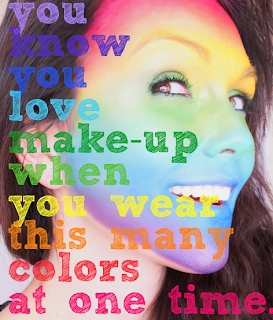 I can't wait to tell someone that about their makeup at church. Whether I use it about myself or joke with one of my sisters. I can't explain enough to u how stinken funny that was! P.s. i knew it was a joke. Hahaaa!!! !